CBS's $280 million buyout of Last.fm is just the latest jewel in Danny Rimer's crown. Business 2.0 reveals how he rules the startup game 5,000 miles from Silicon Valley. (Business 2.0 Magazine) -- On a late May morning when I visit Danny Rimer at his London office, he puts on a big grin every time either of two subjects comes up. The first is his friendship with Quincy Smith, his former VC partner and the newly christened president of CBS Interactive (Charts, Fortune 500). The second is Last.fm, the online music startup in which Rimer invested and whose founders I'm about to go see. LONDON CALLING: Chatted on Skype? Logged on to the Web via Fon? Those are just two of the companies backed by Danny Rimer's Index Ventures. By the end of the day, I come to understand the secret behind Rimer's smile: At the very moment we were talking, CBS was inking a deal to acquire Last.fm for $280 million. "Man!" Rimer exclaims later. "You kept asking all the right questions, and I wanted to tell you, but I had to keep my mouth shut!" Rimer and his firm, Index Ventures, reportedly invested less than $5 million in Last.fm in 2006 for a hefty stake in the company, so the deal yielded a huge return. But more than that, it was a validation of Rimer's worldview. Born in Canada, raised in Geneva, schooled at Harvard, weaned in Silicon Valley, residing now in London, Rimer is a truly global citizen with a genuinely global perspective on tech. And here's what he has to tell us: When it comes to innovation, Europe is the place to be. Now, before you shout "The dude is mental!" and turn the page, it's important to understand what Rimer is -- and isn't -- saying. "Will Europe ever get to the level of innovation in the Valley?" he asks rhetorically. "Unlikely. Is the hit/miss ratio going to be higher here than there? Unlikely." But Rimer believes that the innovations that do arise in Europe tend to be paradigm-shifting, industry-upending, world-changing stuff. Think of Linux. Think of Skype. Hell, think of the Web itself. And while these three examples don't constitute a slam-dunk case, Rimer's theory is intriguing and important. It's also the basis on which he has become one of the hottest VCs on the planet. Professionally speaking, Rimer, 36, was bred for the kind of success he's now enjoying. As an infant analyst at Hambrecht & Quist, he helped take Netscape public, then was promoted to head H&Q's burgeoning Internet practice. In 1999 he became a VC, joining the Barksdale Group, where he worked alongside Smith and scored two big hits: TellMe Networks and Neoteris. But when the group's backers (former Netscapees Jim Barksdale and Jim Clark) decided not to do another fund, Rimer was at loose ends. Then 9/11 hit, stranding him in Europe after his honeymoon. 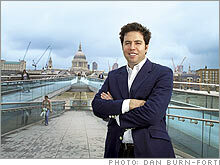 "I started talking to the Index guys, who were planning to open a London office," he recalls. "I started thinking, maybe it's time to come back home." Connecting with Index wasn't much of a stretch for Rimer: His brothers Neil and David were two of the firm's co-founders. (A fourth Rimer, Richard, used to work there too.) Launched in 1996 and based in Geneva, Index was premised on the notion, as Danny puts it, "that Europe might be a great opportunity for venture capital because there was a lot of innovation but no infrastructure to promote it." A lot has changed in the decade since, and Index has been a big part of it. The infrastructure that Rimer refers to -- recruiters, law firms, and, of course, venture capital -- has begun to be erected. The proliferation of broadband has allowed Europe to tap into the global tech marketplace. And then there's the emergence of entrepreneurial role models, in particular Niklas Zennström and Janus Friis, the founders of Kazaa, Skype, and now Joost. For Rimer, the pair are more than just role models. In 2004 he helped raise $18.8 million for Skype and took a seat on the company's board; the $2.6 billion sale to eBay (Charts, Fortune 500) occurred 18 months later. What the entrepreneurs he backs have in common, Rimer says, is a certain rawness -- a crazy passion that, he believes, has started to diminish in Silicon Valley. "In the Valley, what's happened is you have entrepreneurs that just want to fill a hole in the market and have a rich exit," he says. "[But] Europeans are first-generation immigrants when it comes to technology. They're on a mission. They're gonna make this thing work, no matter what." Rimer admits that this attitude is as much a matter of necessity as integrity. "The JotSpots of the world could never have happened here," he says, referring to a Valley startup swiftly launched and swiftly sold to Google (Charts, Fortune 500). "You can't do the quick-flip thing that Silicon Valley specializes in. There's no way to modify and tweak things quick enough to make yourself the ideal acquisition target. So it forces you to build companies from the get-go that have a chance of surviving on their own." That poses problems for European VCs, Rimer included. Say what you will about quick flips, they're helpful to a venture firm's portfolio. So Index has to play in the United States too, while at the same time protecting its European turf from the ever-increasing incursions of the gang from Sand Hill Road. Rimer points to the Web-based ad placement startup Spot Runner (see "Commercial interest") as one example of his transcontinental mojo. The sale of Last.fm to his pal Smith at CBS (which also has a stake in Joost) is another. Yet for Rimer the key to Index's success is differentiation. "Our peers think they're being global by hiring local folks to create a franchise office and go after that geography," he says. "You've got Benchmark Europe, Accel Europe, Sequoia Israel -- they're all the same model." But Index doesn't do franchise offices. There's Geneva and London, and that's it. "We've taken on the intellectual challenge of not relying on the partner who happens to sit in Silicon Valley or in China or in India. We're asking entrepreneurs to think about global opportunities, so we have to think globally too." A considerable challenge, no doubt, but Rimer seems more than up to it. For other VCs, globalization is still just a theory. For Rimer, it's the story of his life. John Heilemann wrote "Pride Before the Fall." His four-part documentary on the rise of the Internet industry appears on the Discovery Channel this fall.